Working with an ivory and gold colour palette we created luxurious rose and hydrangea domes with 88 Events at Mar Hall. A glamorous and elegant wedding. Lydia and Chris married in an outdoor ceremony at Fernie Castle, Cupar in summer. This colour palette is one of our all time favourites combining peaches, pinks, blues, reds and green foliages. We invited photographer Andrew Rae to go behind the scenes with our team as we set up this stunning barn wedding in North Ayrshire. Luxurious domes of hydrangea and roses created statement pieces for this summer wedding at Cameron House. Bright and mid pink tones were combined with ivory to create the flowers for Emma and Richard's lochside wedding. Pale pink and ivory flowers in two stunning locations: Kilmaronock Church in Gartonharn followed by a reception at Boturich Castle. This contemporary urban wedding combined interesting architectural shapes with yellow spring flowers at Glasgow City Halls. 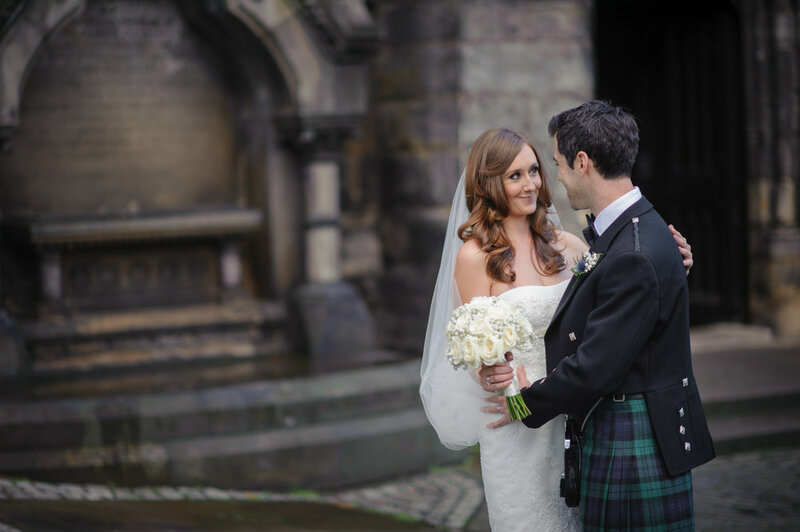 Lisa and Lewis got married at The University of Glasgow Chapel before their reception at Lochgreen House Hotel. We loved the soft pink and ivory tones of this wedding that made for an extra dreamy day. Soft pastel colours and silvers were combined to create the flowers for Jenna and Ryan's lochside wedding. Our first ever Persian wedding took place in Edinburgh city centre in the height of summer. Sanam and Dave had exquisite taste when it came to choosing their ivory and lime green palette. Elegant photoshoot at stunning wedding venue with Craig and Eva Sanders. Lilac and ivory tones were used to create headpieces, bouquets and fill vintage teapots. Delicate flowers and pretty posies make for beautiful flowers and a beautiful day for this Scottish/Italian wedding at Carnbooth House. Classic, elegant combinations of pale pink and ivory were the order of the day for Hazel and Chris' wedding day at House for an Art Lover. Early summer on the bonnie banks of Loch Lomond provided the backdrop for Elaine and Ross's bright and colourful flowers. We created luxurious table centres and a magical Chuppah in soft ivory and lilac tones for this enchanted woodland-themed wedding at Mar Hall. 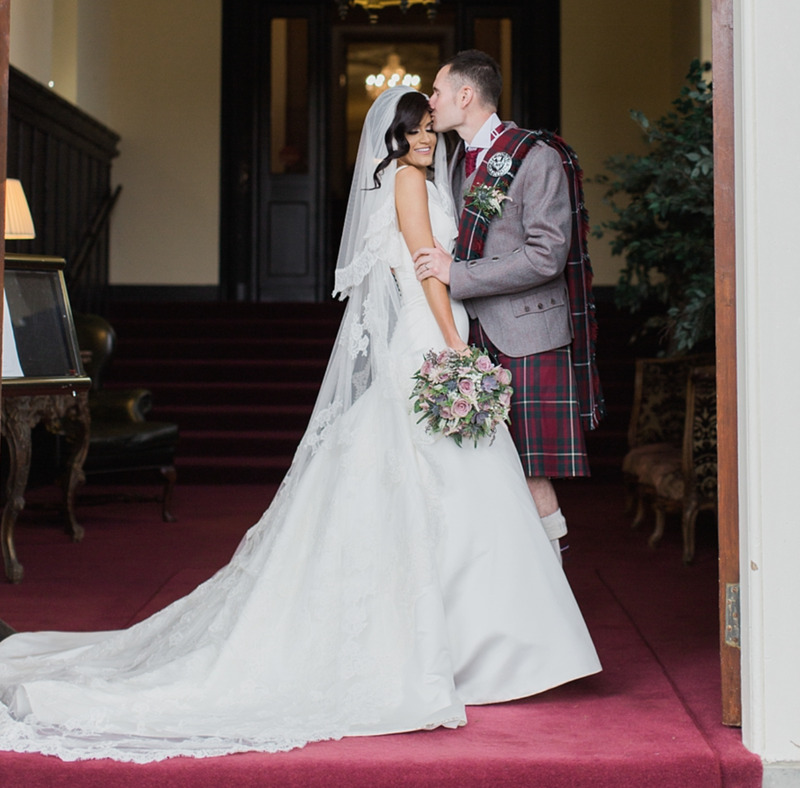 Kerri and Robert married in an elegant wedding at Mar Hall. Garden style elevated designs full of beautiful botanical elements filled the Pavillion for the wedding reception. This stunning summer wedding at Roman Camp in Callander gave us the perfect excuse to create a stunning archway at the entrance. Anne and Harry's classic ivory wedding took place at Cameron House on the banks of Loch Lomond. Delicate combinations of blush pinks and ivories were abundant at this sunshine filled Loch Lomond wedding at Cameron House. The views out over the water at Altskeith House are stunning. We loved the mix of classic and contemporary styling which Fiona and James chose for their lochside wedding.